Sony's 10-megapixel, 5X-optical-zoom (24mm to 120mm) Cyber-shot DSC-WX1 is among the first pocket cameras to offer Sony's redesigned, low-light-optimized Exmor R sensor. Those low-light chops are the marquee feature of this very compact camera, which excels in dark situations thanks to its unique shooting modes. Rather than forcing the shooter to boost ISO equivalency in order to take a brightly exposed photo in low-light situations without a flash, the WX1's Handheld Twilight mode snaps up to six shots at different exposure settings in rapid succession, then overlays the images to create a sharper photo than most point-and-shoots produce in low light. The Handheld Twilight option works best in pitch-black settings; the sensor is so sensitive to light that any exposure to a light source in an otherwise dark environment can make those well-lit areas look a bit blown out and murky. Besides the Handheld Twilight mode, the WX1 has an Advanced setting in its Scene Recognition mode that lets you take two shots with one press of the shutter button: one with the flash on, and one with the flash off. It displays those two shots side-by-side, letting you pick the one you think looks better and eliminating some of the guesswork involved when taking photos in low light. The WX1 also comes with the excellent Sweep Panorama mode found in other new Sony cameras. This mode allows you to press the shutter button once, pan the camera from side to side, and create an instant panoramic image with surprisingly little effort. It works best with static landscapes, as any moving objects in the frame can appear to stretch across a large portion of the panoramic scene. In our lab's imaging tests, the Cyber-shot DSC-WX1 significantly outshone earlier point-and-shoot cameras from Sony in image quality. Our panel of judges rated color accuracy and overall image quality excellent in test shots taken with the WX1, but images did show a bit of distortion and lack of sharpness. Despite that, the WX1 earned an overall image rating of Superior when compared with other pocketable digital cameras. Battery life is also strong, as the camera took 394 shots on a single charge of its lithium ion battery. That was good enough for a battery-life rating of Very Good. This Cyber-shot is an extremely compact camera, a bit smaller than a deck of cards, and unassuming enough to fit in a shirt pocket without a problem. Although the wide shutter button is big and comfortable to use, those with bigger hands may have trouble with the smaller mode dial, back-camera buttons, and zoom bar. A small button next to the shutter release places the camera in burst mode, which is capable of taking up to 10 shots per second. The mode dial on the back of the camera provides quick access to such modes as Handheld Twilight, Sweep Panorama, Automatic Scene Recognition, program, scene selections, Easy, antiblur, and high-definition video (the WX1 records 720p video at 30 frames per second). 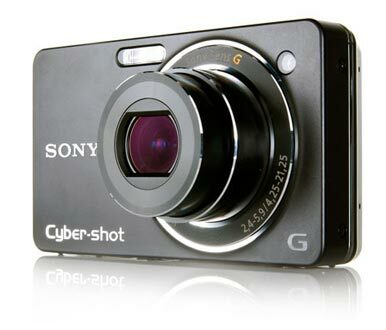 The 2.7-inch LCD screen, which serves as the camera's only viewfinder, is bright, crisp, and sharp. In fact, it may be a little too sharp: Even though the camera's image quality is very good, photos look better on the camera's LCD than after you've uploaded them to your computer. This is especially evident in Handheld Twilight mode shots, where brightly-lit highlights look noticeably less sharp than they do in images played back on the camera itself. As with many Sony products, the WX1 comes with a couple of proprietary issues to think about before buying: It is one of the last Sony cameras that supports only Memory Stick format storage, and the USB cable used to offload photos directly from the WX1 has a proprietary connector on the camera's side of the equation. At around $330, the WX1 does cost a bit much for a camera with no manual shutter or aperture controls. However, for the price, you get a very compact, very stylish camera that takes excellent photos in dark settings, and its unique in-camera modes make it a great all-purpose pocket camera.